Have you ever actually tried using the drying racks that you get from punching out holes from the box of Easter egg dye? 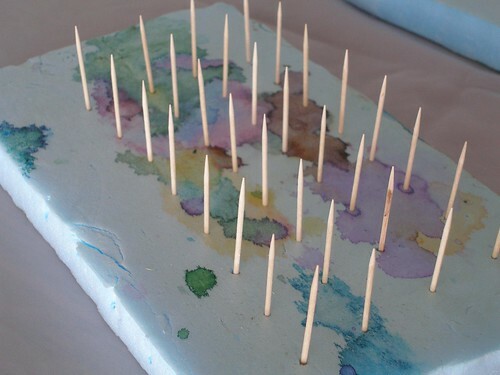 Instead we use a piece of styrofoam and just stab a bunch of toothpicks into it at regular intervals (a bit less than an inch). We reuse it year after year, which is why it looks like this. 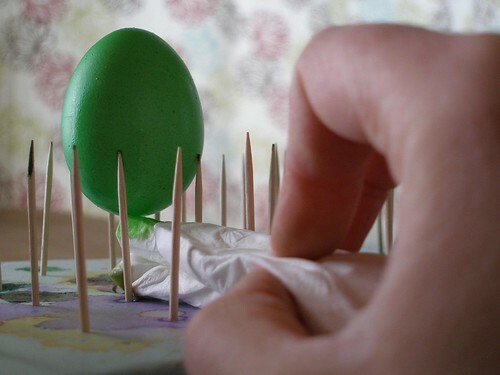 At the end of egg-dying season, I pull out all the toothpicks and store them in a baggie taped to the base. This setup is sturdy enough to hold both hard-boiled and blown eggs with no problems at all. 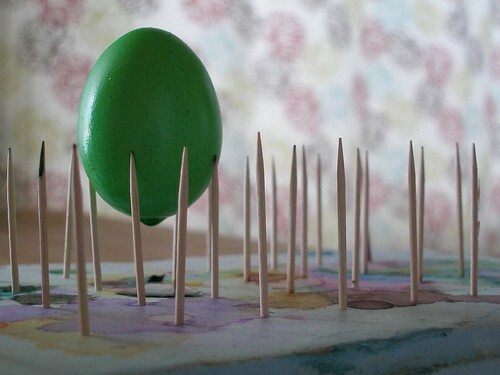 Just make sure that after dying any blown eggs, you put them with one of the holes facing down to allow any extra dye to drip out. You can cut down on mess if you drain excess liquid into the sink before placing the eggs on the drying rack, but they'll still drip a bit. Using this drying rack tends to cut down on the 'wet spot' that HRH Gigi mentioned because the eggs aren't sitting in a pool of liquid. All you need to do is just touch the drip with a clean rag or paper towel to absorb the liquid. Now I must confess that Easter (like Halloween) is one of the holidays that I get really craft geeky about. Next week I'll have posts describing how I hang the eggs (with a fun new trick that I just figured out this year) as well as some unusual designs that we've been working on. Be sure to stop by if you're interested. Or stay far away if you're not. What a great idea! I remember cursing last year because the flimsy cardboard thing with the holes collapsed and some of the eggs crashed into each other! I was thinking some sort of drying system using toothpicks would be handy, but hadn't gotten farther than that -- thanks for being a step ahead of me on that one!! ooooh - what a great idea! !